PROPERTY OVERVIEW >> $1036pw -- Price incl. 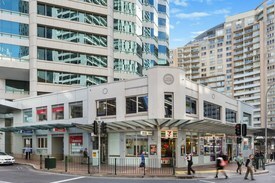 Modern and stylish private office space with car parking in an amazing position on the Pacific Highway in North Sydney. This modern workspace is spread over three levels and offers light-filled office space for up to 17 people. Fully furnished with 17 x new desks, chairs and 3 draw lockable pedestals (Note the images do not show the new furniture) the space also comes with internet, electricity. There are 2 car parks which can be rented for $350 per month if required or the team can park around the local area as there is free parking in the back streets. Features include a colonial style balcony, horizontal skylights and an oversized pothole window which together allow masses of natural light to reach all three levels. There is large managers office/meeting room and a loft boardroom in the space all furnished with tables and chairs. The accommodation comprises three levels and dual entrances from the street and courtyard. If you’re looking for your very own private office in North Sydney, book a tour at 281 Pacific Highway now – this rare and unique office space is currently at a great price and will be snapped up fast. This three-level townhouse is one of 10 modern townhouses ideally located on the Pacific Highway. Classified B4 - Mixed Use, this North Sydney office’s ground floor could be used as a great retail showroom and the lockup storage is also perfect for any retail-oriented business. The contemporary complex features underground car parking with remote security doors and a neatly maintained courtyard garden where your team can enjoy their breaks in the sun. The 3-floor interior, great natural light and green-filled outdoor space altogether create a lovely homey atmosphere that will encourage wellness and collaboration within your team. Even better, with 2 onsite car parking spaces, a bus stop at the door, trains less than a 10-minute walk and free street parking across the road, the commute is easy for your whole team. You will also be just one minute from West Street and the boutique cafes in the area. The advertised office space is perfect for a team of 18. If you need more or less space, we have over 30,000 furnished workspaces all over the world suitable for a team of 1 to 200+. Our award winning team offer a free service that will help you find the perfect solution for your needs, so reach out if you need more help. AFFORDABLE + NEWLY REFURB.. Price: FROM $30,804 + GST PER AN..